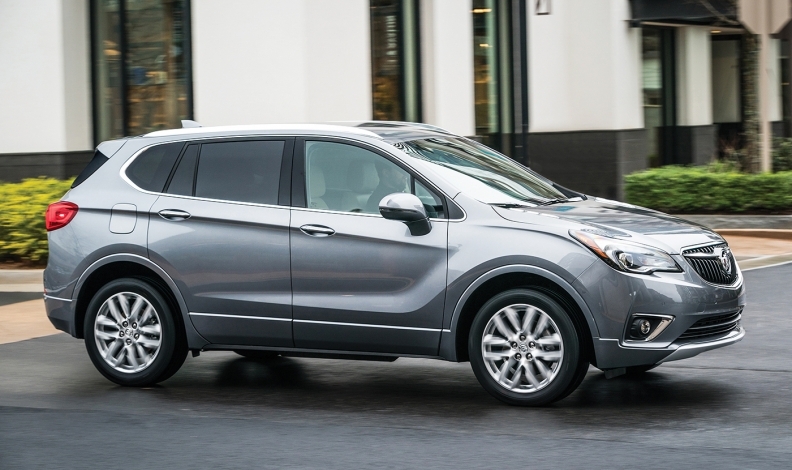 GM said it sold 210,000 Envisions in China last year compared with 42,000 in the U.S.
DETROIT -- General Motors could pull the China-made Buick Envision from the U.S. market if the Trump administration does not grant the company a tariff exemption on the vehicle. The automaker sees the potential exemption as “the only way” to continue offering the vehicle to U.S. consumers, according to GM President Dan Ammann. Ammann declined to comment on if GM has sought other exemptions or plans to do so in the future. Carmakers across the world, from Germany’s BMW AG to Hyundai Motor Co. of South Korea, have urged President Donald Trump’s administration not to impose tariffs on cars imported to the U.S. as part of a trade war with China. GM itself warned in June it might shrink U.S. operations and cut jobs. Ammann’s remarks echo those in a July 30 filing with the U.S. Trade Representative Office about excluding the compact crossover from import tariffs. GM sold 210,000 Envisions in China last year compared with 42,000 in the U.S., according to the filing. Those domestic sales aren’t enough to support a U.S. manufacturing plant, but GM needs to offer the model to have a complete lineup against brands such as Audi, Lexus and Mercedes-Benz, it said. Sales of the Envision in China and in the U.S. “both lead to significant repatriation of funds” to invest in U.S. manufacturing and development of next-generation automotive technology, GM said in the filing. “The profitability that we generate on that vehicle, selling it in the U.S. market, we obviously reinvest in the business here so we think it’s in everybody’s interest for that to continue,” Ammann said. Such tariffs are expected to have a much broader effect on Buick than GM's other three brands. It could put Buick in an untenable position in the U.S., which accounted for only 15 percent of the brand's 1.4 million global sales last year -- while China made up 83 percent. The Envision, which former UAW President Dennis Williams called the “Invasion,” has been a sore point for union officials and some politicians. While GM prefers to build vehicles were they sell them, GM began importing the vehicle from China in May 2016. It was the first light-duty vehicle of any domestic automaker to be built in China and imported for U.S. consumers. The Envision is made by Shanghai GM, a joint venture between GM and SAIC Motor Corp.